We are in Italy, therefore we thought it would be out of place to include international cuisine in our menu. We offer Italian food: only the good, healthy and genuine one. And Val di Sole and Trentino have so many local products to make you feel like you reached a paradise of flavours. You will mostly find our products, tasty and surprising combinations prepared to live up to our vocation of explorers. You will be able to experience a culinary journey in our restaurant or our lounge café. YOU ARE AN EXPLORER. EVEN AT THE TABLE. Observe each dish as if it was for the first time. Let your choices be guided by your intuitions. Experience at least one new taste everyday. Establish a connection with the environment that surrounds you. Use all your senses to marvel at the wonders that you are offered. To ensure that your choices meet not only your taste but also your state of mind, four set menus have been prepared. Our Chef Mario Trifilò and his young creative staff invite you to explore them! Creative dishes which stem from our chef's passion to broaden the horizons of traditional cuisine. This menu is aimed at those who love exploring. Dishes which are tied either to Trentino traditions or to the rich Italian culinary heritage. Created not only to promote the territory but also to pay tribute to one of the world's most highly regarded cuisines. Vegetarian dishes prepared with seasonal products. Ideal for those who have the passion for healthy eating but who alsowant to eat well. A territory is explored through the elements which create it, as if it were a mosaic. Each one of these elements transmits a different emotion or feeling depending on your mood. Wine lovers know that in each bottle of wine, the territory, the warmth, the mood and the local winemakers' efforts can be found. This means exploring a place through the smells, feelings and emotions that a product which is closely related to a territory is able to convey. Let the natural elements inspire you. These are dynamic, sparkling and euphoric wines which co-exist with strength and lightness, complexity and freshness. These are spontaneous wines which are immediately engaging. They are companions, often friends. These wines are full of character and expression, tied to traditions. Resulting in engaging, intense and articulated wines. Wines created from the research and the stubbornness of the winemakers. Ambitions are slowly revealed which provide strong emotions. Wines which satisfy and quench not only the body, but also and above all the soul. These are wines of excellence which have the precious task of satisfying all the senses. Frendship between our families, Rossi (MONROC) and Dorigati (Cantina Dorigati), has made two special Trentino wines dedicated to our guests. REDROC, red wine Trentino Rebo DOC and WHITEROC, white wine Trentino Pinot Grigio. At Monroc we've thought of everything. We have selected the best local products from Trentino and the Val di Sole for you to taste and buy. Bring a little bit of MONROC and Val di Sole home with you or for someone back home! 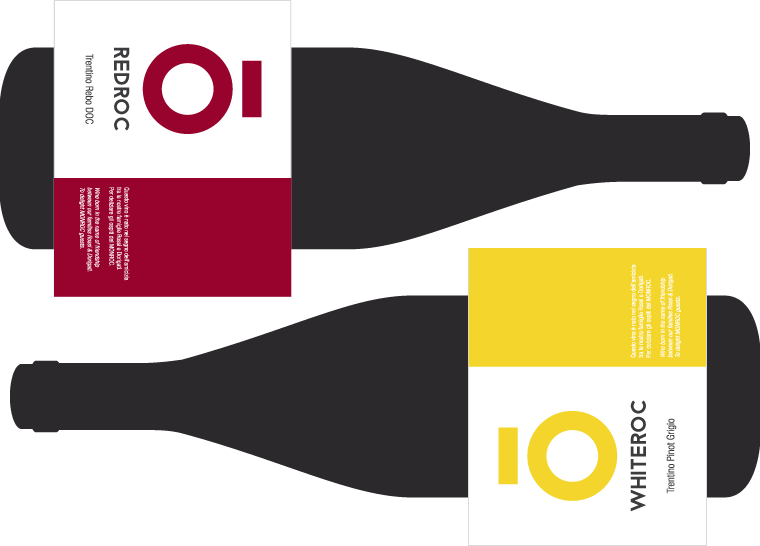 RED ROC & WHITE ROC WINE, the #monrocpeople's choice, created from the collaboration with the Cantina Dorigati (winemaker). CIOCOROC, the MONROC chocolate bar in two varieties, milk chocolate with chopped hazelnuts and dark chocolate with strawberries. ROCBEER, produced by the Val Rendena brewery in Pinzolo. Water and the pure clean air of the Brenta Dolomites, these are the ingredients in ROCBEER. NUTROC, a chocolate spread produced by Ciocomiti here in Val di Sole. ROCLET, MONROC Casolet cheese. Presidio slow food (A food protection association), make this the cheese par excellence of the Val di Sole. It is a raw curd (the milk curds have not been heated during the cheese making process) soft mountain cheese made with whole milk. TRENTOROC, the prince of the wines couldn't miss in our wine cellar. This TRENTOROC is born from the collaboration with the PEDROTTI wine cellar.